Use Crystal Clear on your hands to cover up sunscreen, repellants, etc. 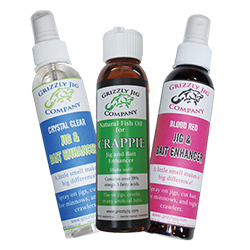 Try our jig sprays on all your jigs, cut bait, live bait, and on all our Dead Ringer plastic baits. Crystal Clear and Blood Red come in 4 oz. spray bottle. Crappie Oil comes in 4 oz. bottle with flip cap.